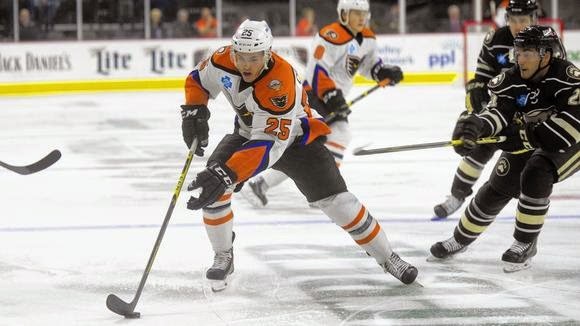 In a bit of a down cycle for the Lehigh Valley Phantoms comes this bit of promising news. On Tuesday, the American Hockey League presented forward Nick Cousins with the league's Player of the Month award for January. Cousins led all skaters in the AHL with 17 points, including 10 goals, over just 13 games. His finest performance of the run occurred on January 17 at PPL Center, when the 21-year-old Ontario native netted his first career hat trick to pace a 5-1 victory against the Binghamton Senators. For the season, Cousins has racked up team highs in goals (14) and points (34) while tied with defenseman and All-Star Brandon Manning for the lead in assists (20). The third-round selection in 2011 becomes the first member of the Lehigh Valley franchise to be recognized with a monthly honor, and the first since goaltender Cal Heeter was given top goaltending honors for the first week of January in 2014. Claude Giroux was named Rookie of the Month for December of 2008 while John Slaney earned Milestone of the Month for the first week of January, 2006 after becoming the league's all-time leading scorer among defensemen. Scott Laughton, before his ascension to the Flyers, took home the seven-day honor for the week ending October 19. Since a four-game win streak, Terry Murray's club has dropped six of its last nine outings, but finished last weekend's 3-in-3 with a surprise 6-2 victory over the Baby Pens in Wilkes-Barre. The Phantoms take on Worcester in Allentown tomorrow night. If Flyers fans want Cousins to get an extended look with the Flyers because their season is heading nowhere, consider the following: the Phantoms are near the bottom of the East in goals per game and sit 11th in the conference, five points out of a playoff spot. They need to have as much offense as possible to aid in their quest to make the postseason for the first time since the club was based in the Spectrum. It wouldn't be very fair to the capacity crowds who have packed the new arena in Allentown to suddenly watch a team raided by the needs of its parent slide down the standings. Bang the link for the full league release, including a monthly honor for an old friend.